Madrid, 2017-Nov-28 — /Travel PR News/ — The World Tourism Organization (UNWTO) announces the winners of the UNWTO Ulysses Prize and the UNWTO Ethics Award, as well as 14 finalists for the upcoming 14th Edition of the UNWTO Awards for Innovation in Tourism. The Awards Ceremony will be held next January 2018 in Madrid on the occasion of the International Tourism Fair, FITUR. The UNWTO Awards recognize inspirational individuals and projects for their innovative achievement as well as their invaluable dedication to developing and advocating sustainable tourism in line with the UNWTO Global Code of Ethics for Tourism and the Sustainable Development Goals (SDGs). The 14th Edition of the UNWTO Awards will take place in January 2018, co-hosted by FITUR, the International Tourism Fair in Spain/IFEMA in Madrid, Spain. The Awards Ceremony will be preceded by the UNWTO Awards Forum where finalists will present their respective projects. UNWTO Ulysses Prize for Excellence in the Creation and Dissemination of Knowledge in Tourism awarded to Valene L Smith. Valene L. Smith, Professor Emeritus and Research Professor at the California State University, Chico, California, United States of America has been nominated as the 2018 UNWTO Ulysses prize laureate. Professor Smith is a pioneer in tourism and anthropology, with an extensive number of projects and accomplishments throughout her extensive career. Her classic book, ‘Hosts and Guests’ (University of Pennsylvania Press, 1977), preceded by her 1953 geography courses, marked the start of this connection becoming explored by an army of scholars. She was recognized in 2000 as a Women of the 20th Century, and is a recipient of the US Chamber of Commerce’s Community Service Award. She is also an active member of various associations including the American Anthropological Association, the Society of Woman Geographers, the American Association of University Women and the American Fulbright Association. The Jury of the UNWTO Ethics Award, comprising Members of the World Committee on Tourism Ethics, has selected Europa Mundo Vacaciones as the winner of this second edition of the Award for its initiative “Europa Mundo Foundation”. Europa Mundo Vacaciones is a Spanish tour operator strongly committed to the principles of environmental and social responsibility and has achieved remarkable results in the implementation of the UNWTO Global Code of Ethics for Tourism, particularly in its contribution to community well-being and sustainable development of tourism. In 2011 it created a Foundation aimed at conducting social activities and development cooperation in different areas and for specific segments of the population, as well as to promoting sustainable tourism in many countries of Africa, Asia, Europe and Latin America. The UNWTO Ethics Award was established in 2016 and is open to all companies and associations that are official signatories of the Private Sector Commitment to the UNWTO Global Code of Ethics for Tourism . To be eligible for the Ethics Award, signatories must have reported on its implementation. 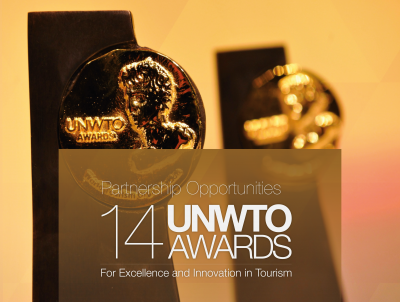 Fourteen innovative projects among 128 applicants from 55 countries have been selected as finalists of the 14th UNWTO Awards for Innovation in Tourism. The winners will be unveiled during the UNWTO Awards Ceremony. The list provided below is based on the alphabetical order of the country. 14th UNWTO Awards Forum, 15 January 2018, Paraninfo, Complutense University of Madrid, Madrid, Spain. 14th UNWTO Awards Ceremony, 17 January 2018 at IFEMA, Madrid, Spain. Register for the events: the registration will open early December. This entry was posted in Business, Festivals and Events, People, Tourism, Travel, Travel Awards, Travel Management, Travelers and tagged 14th Edition of the UNWTO Awards, finalists, UNWTO, Valene L. Smith, winners. Bookmark the permalink.